Benjy Melendez says that as a teenager in the South Bronx, the lights on the street at night came not from streetlights, but fires set by arsonists. “You seen fire all over the place,” says Melendez. They could see the stars at night, too, since broken streetlights were seldom repaired, and most buildings were abandoned. “Oh my goodness, the place looked like Germany after the war,” he said. It was the dangers of this broken environment that led Melendez to start a gang with his brothers in 1966. They called themselves the Ghetto Brothers, but the group soon grew larger than their family. Julian Voloj, a German writer and photographer who wrote a graphic novel about the Ghetto Brothers, says they got their street cred with the addition of a former marine named Carlos Suarez, also known as Karate Charlie. “He was an ex-Marine, he was in Vietnam before and he was a really tough guy,” said Voloj. “They were really tough gang and they were large.” By 1971, they were one of the biggest gangs in the South Bronx, with membership in all five boroughs of New York. South Bronx gangs were also grabbing national headlines in 1971. The New York Times called the South Bronx the “capital of teenage gang power,” noting there were at least 85 gangs – including the Ghetto Brothers- and thousands of gang members in the area. Violent turf wars routinely left young men dead in the streets. It became clear that the violence was getting out of hand. That same year, a member of the Black Panthers named Joseph Mpa approached several South Bronx gangs to talk about ways to lessen the violence, and turn the groups into positive forces in the community. Melendez and the Ghetto Brothers responded. First off, they changed the post of “warlord” – the gang member who enforces turf boundaries – to “peace ambassador.” Melendez chose another Benjy- Cornell Benjamin, also know as Black Benjy – for the job. Black Benjy was reportedly beaten to death after trying to negotiate with those Hunts Point gangs. The killing of an unarmed gang member pleading for peace incensed gangs across the borough. Many called for war. According to Voloj, Carlos Suarez advocated for revenge, but Melendez was conflicted. Before the two made a decision, they decided to visit with Black Benjy’s mother. She pleaded for peace. Soon the Ghetto Brothers announced that all the gangs of the South Bronx would hold a summit meeting to hash out the situation. 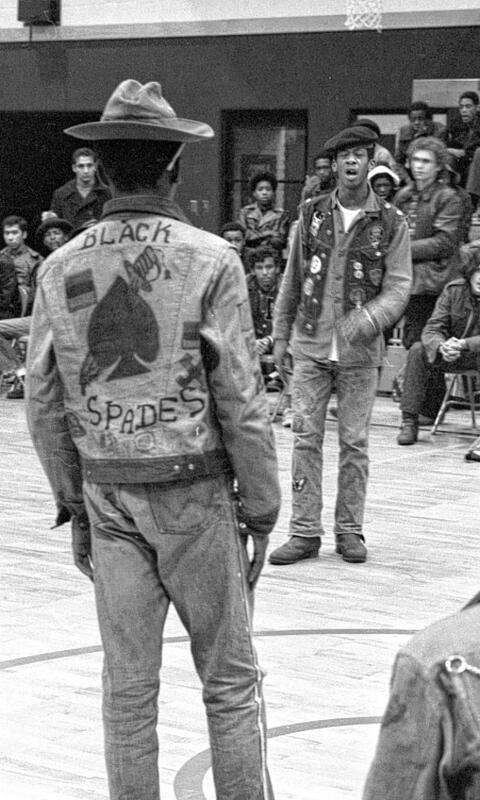 On December 7th, 1971, more than 100 South Bronx gang leaders crowded into an auditorium of a local Girls and Boys Club. Young men and women were frisked as they entered. Local reporters were there. Police snipers set up across the street in case anything got out of hand. The venting and mediation worked. The gangs agreed to a truce outside the media spotlight. They met at the abandoned storefront that served as the Ghetto Brothers’ headquarters and signed a detailed agreement with specific rules. According to Afrika Bambaataa, one of the founders of hip-hop who also grew up in the Bronx, it really helped. “It helped to slow down a lot of beef,” he said in an interview with photographer Joe Conzo a few years back. Bambaataa was a member of a gang called the Black Spades, and was at the peace meeting in 1971. He said the truce actually improved the situation in the Bronx. There were still small fights, but overall, the truce held. “So it took a lot of stress and sticking together to keep all of these different groups under that whole family, or truce, that the Ghetto Brothers, brother Benjy has put forward for everybody to come under,” said Bambaataa. One of those ways was music. The Ghetto Brothers were also a band, and one that liked to throw threw street parties. Under these new rules, people could now travel safely to parties in other neighborhoods, and these street parties were allowed for a new kind of musical cross pollination. That set stage for what happened a year and half later. In music lore, there’s one infamous party where hip hop all started. West of where the Ghetto Brothers ruled, DJ Kool Herc spun records at two turntables — back and forth — while kids from across the borough danced and took in this new blend of sounds. Most music historians agree that DJ Kool Hurc’s party was possible because of the rules established by the gangs to keep the peace. “There was an exchange of ideas, exchange of creativity and hip-hop — everything developed during that time. Bambaattaa in the east. Grand Master Flash further North. They could travel there and see what was happening there,” said Voloj. No one knows what would have happened if the Ghetto Brothers didn’t call that peace meeting in 1971. The late 70s was still a tough time. Don’t forget, these were the years that spawned the line “the Bronx is burning.” Just a few years later, the crack epidemic of the 1980s would bring in a new generation of violent gangs. The peace only lasted a few years, and it’s easy to argue it’s effects were limited. But it’s influence wasn’t, according to Voloj. This story by producer Andrew Parsons comes from our episode on reconciliation in American history. Also check out Julian Voloj’s upcoming graphic novel, Ghetto Brother: Warrior to Peace Maker.